I LOVE, LOVE, LOVE this time of year! 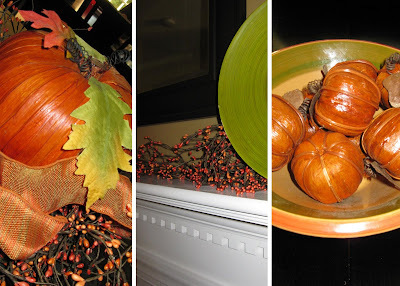 Although my family room/kitchen area is full of warm colors, I always do some additional fall decorating by adding a little something here or there. You will find pumpkins, both big and small, berries and fall flowers sprinkled throughout the first floor of our house. I always think about decorating the outside of our home more but because of 1) The way that that my entry is designed and 2) Just plain laziness, this just never happens! I adore those homes that have the hay bails and pumpkins out front with the newly blooming mums! Maybe next year...YEAH right! In our home a pumpkin adorned with berries and festive ribbon sit on the island, berries sprinkle the mantel and mini raffia pumpkins fill the breakfast nook table bowl that normally is home to some apples. Fall, fall, fall...I love it! Me too! And I did get mums for my front porch. I'm happy because they've really lasted well unlike most years! I love the fall decorations! You have inspired me to go ahead and get pictures of my harvest decorations! @Kristy, get some photos...I would love to see them! Thanks for stopping by!